Jamie + Adam got married in one of the cutest towns in the South- Madison, Georgia. The Variety Works is awesome- a renovated 1800s manufacturing building turned gorgeous rustic wedding venue with gardens, lawns, gazebo, and a spring. It really is a perfect place to get married. Jamie and Adam are pretty awesome, too. I know I probably say people are great a lot because of how laid back they are, but Jamie gets the ANTI-bridezilla award. She was smiling, not worried about her dress, not stressing about small details, totally just enjoying her day and loving the people around her. People kept telling her to pick up the back of her dress so it didn't get dirty and she was not at all concerned. Just awesome. 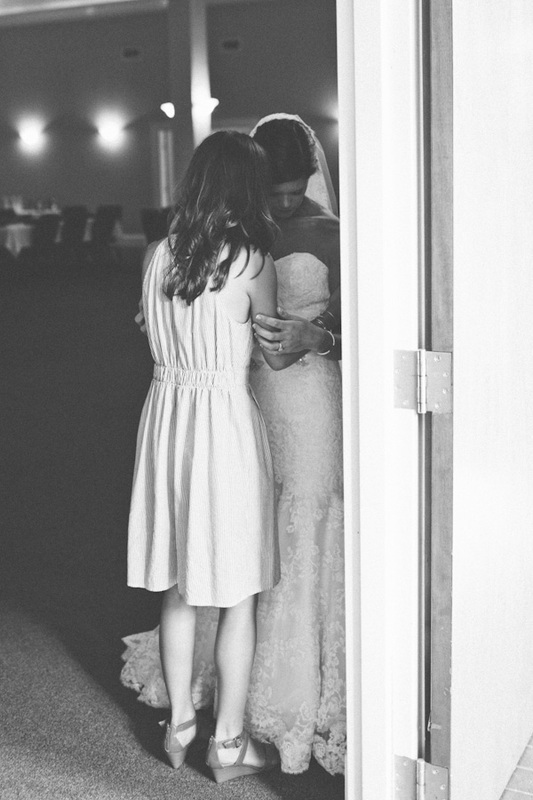 Before the ceremony I was looking for Jamie and found that she was being prayed for by a dear friend of hers, Nicole. I ran to get a few pictures of those moments and afterwards found out that Jamie and Nicole met through the blogosphere when they started following each other's blogs. Turns out Jamie is an awesome lifestyle blogger (check out her absolutely adorable blog here) and a lot of her friends all became connected through blogging. Nicole is from Mississippi (see her blog here) and she and Jamie have made the trek to be at each other's weddings this past year, which I think is so sweet. The reception was full of southern charm, with all the fixins' of a southern meal (fried chicken, mac 'n cheese, rolls, etc- bring on the carbs!!! ), mason jars, and a wagon that held the wedding cake and Atlanta Braves groom's cake. I especially loved the little pies that were given as favors to the guests. Oh, and the candles hanging from the ceiling in glass balls, all lit up! There must have been at least 100 of these and they were beautiful. Adam's parents told me that 35 years ago when they got married it happened to be a full moon, and how it looked like it would be another full moon on Jamie and Adam's wedding day. I sadly forgot to get a picture of the two of them with the moon behind them, but when I drove home after the wedding I looked up into the clear sky and saw a big full moon. So I got out of my car, unpacked my camera gear, and took this shot. It's not legendary or National Geographic material, but it is a full moon on their wedding day, the same moon that Adam's parents looked at 35 years ago when they were married. I do think that is significant. In some deeper way it represents enduring marriage and a God who gives us light day in and day out, new mercies every morning. So glad Adam and Jamie are married, and to read Jamie's blog about their first week together is to remember that marriage really is one of best gifts God gives us. Two people who are best friends get to love, serve, and walk through life together - you guys are great and I wish you the best!! !